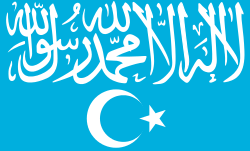 One of the flags used by AQI in their video releases. 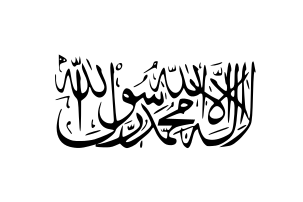 Variants used white text for the circle and the shahada. 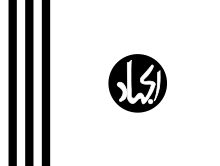 Tanzim Qaidat al-Jihad fi Bilad al-Rafidayn (TQJBR) ("Organization of Jihad's Base in Mesopotamia", Arabic: تنظيم قاعدة الجهاد في بلاد الرافدين‎‎), also referred to as Al-Qaeda in Iraq (AQI) or Al-Qaeda in Mesopotamia, was an Iraqi Sunni Islamic Jihadist organization affiliated with al-Qaeda. It was a major combatant actor in the Iraqi insurgency and played a central role in the establishment of the Mujahideen Shura Council in Iraq and the Islamic State of Iraq. On 3 December 2004 AQI attempted unsuccessfully to blow up an Iraqi–Jordanian border crossing. In 2006 a Jordanian court sentenced al-Zarqawi and two of his associates to death in absentia for their involvement in the plot. AQI claimed to have carried out three attacks outside Iraq in 2005. In the most deadly, suicide bombs killed 60 people in Amman, Jordan on 9 November 2005. They claimed responsibility for the rocket attacks which narrowly missed the American naval ships USS Kearsarge and USS Ashland in Jordan, and also targeted the city of Eilat in Israel, and for the firing of several rockets into Israel from Lebanon in December 2005. The affiliated groups were linked to regional attacks outside Iraq which were consistent with their stated plan, one example being the 2005 Sharm al-Sheikh bombings in Egypt, which killed 88 people, many of them foreign tourists. 1 2 Pool, Jeffrey (16 December 2004). 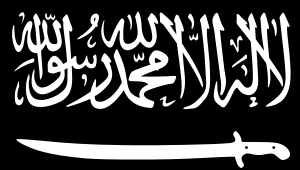 "Zarqawi's Pledge of Allegiance to Al-Qaeda: From Mu'Asker Al-Battar, Issue 21". Terrorism Monitor. 2 (24): The Jamestown Foundation. Archived from the original on 30 September 2007. Retrieved 30 July 2014. 1 2 "The War between ISIS and al-Qaeda for Supremacy of the Global Jihadist Movement" (PDF). Washington Institute for Near East Policy. June 2014. Retrieved 1 January 2015. 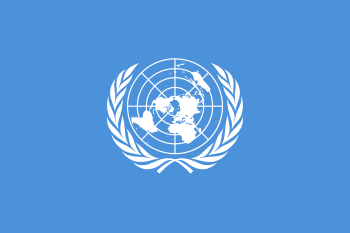 ↑ "Govt bans al-Zarqawi terror group". The Sydney Morning Herald. Retrieved 20 May 2015. ↑ "Zarqawi pledges allegiance to Osama". Dawn. Agence France-Presse. 18 October 2004. Archived from the original on 29 December 2007. Retrieved 13 July 2007. ↑ "Al-Zarqawi group vows allegiance to bin Laden". NBC News. Associated Press. 18 October 2004. Retrieved 13 July 2007. 1 2 "Al-Qaeda in Iraq names new head". BBC News. 12 June 2006. Retrieved 27 February 2015. 1 2 3 4 5 "Country Reports on Terrorism". United States Department of State. 28 April 2006. Archived from the original on 11 March 2007. Retrieved 25 July 2014. ↑ Whitaker, Brian (13 October 2005). "Revealed: Al-Qaida plan to seize control of Iraq". The Guardian. Retrieved 19 September 2014. ↑ "Group seizes Japanese man in Iraq". BBC. 27 October 2004. Retrieved 29 December 2014. 1 2 3 4 5 "Fast Facts: Abu Musab al-Zarqawi". Fox News Channel. Associated Press. 8 June 2006. Retrieved 29 December 2014. ↑ Ware, Michael (11 June 2008). "Papers give peek inside al Qaeda in Iraq". CNN. Retrieved 15 December 2014. ↑ "Al-Qaeda claims to have killed Egyptian envoy". The New York Times. 7 July 2005. ↑ Caroll, Rory; Borger, Julian (8 July 2005). "Egyptian envoy to Iraq killed, says al-Qaida". The Guardian. London. 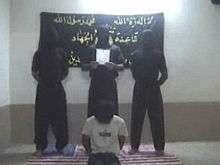 ↑ "Al-Qaeda threatens to kill abducted Egyptian envoy". Middle East Online. July 6, 2005. Retrieved 30 December 2014. ↑ Howard, Michael (18 July 2005). "Three days of suicide bombs leave 150 dead". The Guardian. London. Retrieved 30 December 2014. 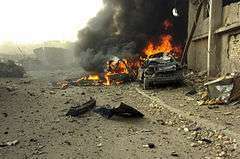 1 2 "Another wave of bombings hit Iraq". International Herald Tribune. 15 September 2005. Archived from the original on 28 October 2007. 1 2 3 Tavernise, Sabrina (17 September 2005). "20 die as insurgents in Iraq target Shiites". The New York Times. Archived from the original on 27 January 2008. 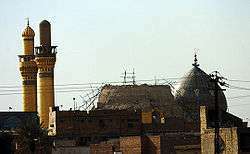 ↑ Insurgents Kill 140 as Iraq Clashes Escalate. Washington Post, 6 January 2006. Retrieved 10 February 2015. 1 2 DeYoung, Karen; Pincus, Walter (18 March 2007). "Al-Qaeda in Iraq May Not Be Threat Here". The Washington Times. Retrieved 28 November 2014. 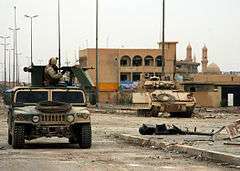 ↑ "TASK FORCE 5-20 INFANTRY REGIMENT OPERATION IRAQI FREEDOM 06-07 (under section 'A Commander's Perspective')". U.S. Army 5th Battalion, 20th Infantry Regiment. Archived from the original on 18 November 2008. Retrieved 23 January 2015. ↑ "U.S. says Iraq chlorine bomb factory was al Qaeda's". Reuters. 24 February 2007. Retrieved 4 December 2014. ↑ "Al-Zarqawi declares war on Iraqi Shia". Al Jazeera. September 14, 2005. Retrieved 12 February 2015. 1 2 Caroll, Rory; Mansour, Osama (7 September 2005). "Al-Qaida in Iraq seizes border town as it mobilises against poll". The Guardian. Retrieved 18 December 2014. 1 2 Abdul-Ahad, Ghaith (27 October 2005). "We don't need al-Qaida". The Guardian. Retrieved 18 December 2014. ↑ Klein, Joe (23 May 2007). "Is al-Qaeda on the Run in Iraq?". Time. Archived from the original on 6 July 2007. Retrieved 20 December 2014. ↑ Het Nieuwsblad edition Oostende-Westhoek (Belgian newspaper), 26 March 2016. ↑ Tilghman, Andrew (October 2007). "The Myth of AQI". Washington Monthly. Retrieved 14 July 2014. 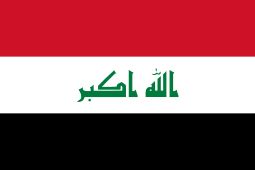 ↑ "Iraqi Insurgents Stage Defiant Parades". The Washington Post. 20 October 2006. Retrieved 29 December 2014. ↑ "Islamic State of Iraq Announces Establishment of the Cabinet of its First Islamic Administration in Video Issued Through al-Furqan Foundation". SITE Institute. 19 April 2007. Archived from the original on 28 September 2007. Retrieved 20 July 2014. ↑ Mahnaimi, Uzi (13 May 2007). 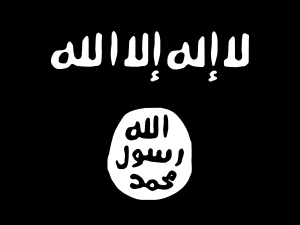 "Al-Qaeda planning militant Islamic state within Iraq". The Sunday Times. London. Archived from the original on 24 May 2011. ↑ Muir, Jim (11 June 2007). "US pits Iraqi Sunnis against al-Qaeda". BBC News. Retrieved 28 November 2014. ↑ "Al-Qaeda disowns 'fake letter'". BBC News. 13 October 2005. Retrieved 4 December 2014. ↑ "British 'fleeing' claims al-Qaeda". Adnkronos. 17 December 2007. Retrieved 20 April 2012. ↑ Aloul, Sahar (19 December 2005). "Zarqawi handed second death penalty in Jordan". The Inquirer. Agence France-Presse. Archived from the original on 29 October 2007. ↑ "Al Qaeda claims responsibility for Amman blasts". The New York Times. 10 November 2005. ↑ "Fatah Islam: Obscure group emerges as Lebanon's newest security threat". International Herald Tribune. Associated Press. 20 May 2007. Archived from the original on 25 May 2007. ↑ "Al-Qaida inspired militant group calls on Syrians to kill country's president". International Herald Tribune. Associated Press. 28 May 2007. Archived from the original on June 1, 2007. Retrieved 6 August 2007.